“That knitting needle can be no used, all shiny and bright-like. You want a real sword, come with me and I show you me other sword, eh?” That, said with a slight leer at Fiora’s chest, roving down to her hips and widening. “I’m sure your other sword is as flabby as the rest of you. I doubt you even know where to put it without your momma needing to teach you.” Some chuckles came from the people watching this exchange. A crowd was rapidly gathering around the Fiora and the barbarian. “Hoi! So smart with words!” The barbarian fairly spat those words out. He was not amused now. Fiora could feel the excitement grow in her, blood surging in her veins like a raging river of magma. A dueling fever, more heady than the finest brandy, so papp… Fiora shook away the thought, but the distaste curdled her tongue nonetheless. She made a quick duelist salute, sword upright and in front of her, giving the blade a light kiss. “I give that smart mouth something to put around when I done with you!” The barbarian charged forward with a roar. Every detail was clearer, every color brighter in Fiora’s awareness, even the minute rust spots on the barbarian’s breastplate. 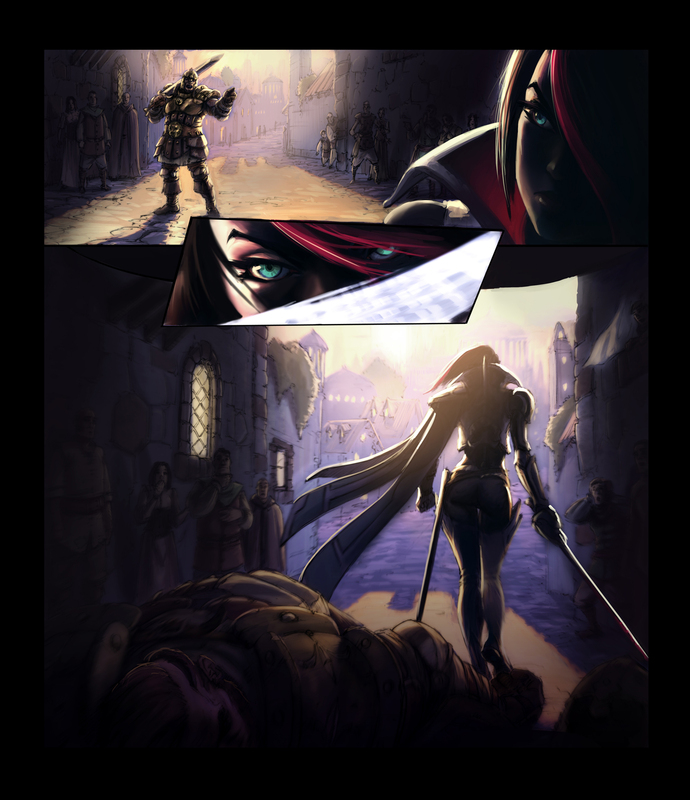 Fiora felt more alive as she lunged, closing the distance between them. The barbarian swung his longsword from his shoulder with every ounce of force. Fiora stepped in, saber moving forward to contact the longsword. Not to block; that massive blow would shatter rocks, let alone a thin blade. The saber tapped the flat of the longsword, then gradually guided the other blade out of line as it slid smoothly down to the crossguard. The wind of the longsword’s passing ruffled Fiora’s hair as her saber cut at the barbarian’s sword hand, then smoothly turned into a thrust at the intersection between 2 plates. The riposte carried Fiora behind the barbarian and she turned, a graceful move with the saber in a tight slash at the barbarian’s back that scored the armor. The slash turned into a low horizontal cut at the barbarian’s side as she passed the barbarian a second time at a crouch. Rising, Fiora used her momentum to guide her saber in an overhead cut at an unprotected point between the barbarian’s neck and shoulder. Like a series of steps in an involved dance, Fiora moved. A beautiful, deadly dance. The blade struck true; blood spurted red from several wounds on the barbarian’s body as she spun around, showing her back as the barbarian collapsed like a house of cards. The flick of her saber cleaned her blade of blood, remarkably little to any curious bystander, but a saber drenched in blood was a saber that had not cut cleanly. Power is nothing without control, her pappa said. This time, Fiora did not suppress the thought. Her pappa had cast the Laurent name into disgrace. Cast into disgrace and spat on it. Walking away from the lump of meat, Fiora had eyes only for what was ahead of her. What one made low, another can make high again. People will learn to respect the Laurents!